Look closely at what you love and you might be surprised. There's a wealth of information there. Especially for those of us who have trouble figuring out which direction we should be heading. The basic idea was to list my favourite artists and see what I could learn from them. I wanted to have a better idea of what attracts me to their work, and how I could incorporate their special powers into what I do—even if only modestly. Trying it out, I was surprised who was on my list—a lot of them were visual artists. I struggled to think of some writers, and I did come up with a few, but I don't think I was being honest with myself. I admired these writers, but I didn't love love them or want to emulate them—well, not at the moment. So today, I thought I'd ask myself, 'What's up with that? ', and tell you about one of those visual artists I picked. There's a photograph of the French-American artist and sculptor Louise Bourgeois that I think's hilarious and sums up her inventiveness and courage. It's from 1975. She's in New York standing outside some brownstone apartments, wearing a latex suit of her own design completely covered in breast-shaped protrusions. “My name is Louise Josephine Bourgeois. I was born 24 December 1911, in Paris. All my work in the past fifty years, all my subjects, have found their inspiration in my childhood. Spending time looking at her work over this past week and reading about her life has been fantastic. I've always loved her drawing and printmaking. The resulting work is amazing. Sometimes figurative, but just as often not. 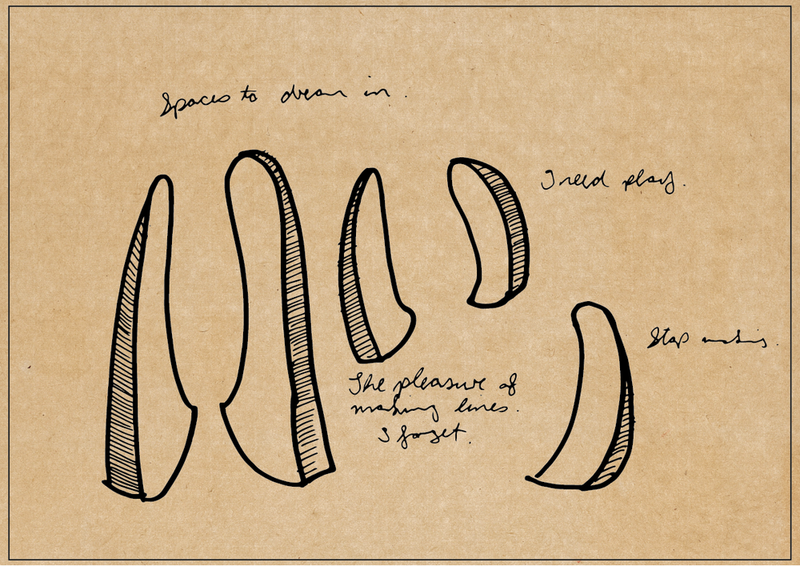 Many feature body parts, or abstract patterns drawn in pen or pencil; some are crude, some alien, some familiar or all three at once—fragments of her life churned and remade and pulled apart again. Coincidentally, I had a bout of insomnia this week. It comes and goes, and like Bourgeois, I've come to accept it when it does. So after two nights of it I thought, 'F*ck it,' and sat up and drew and wrote whatever came to mind. While I was doing it, it occurred to me that everything I create is for other people to see. With the exception of my journal, I rarely do or make things for just me only. This means there's no real space to experiment and try things out. As a result, everything becomes heavy with this pressure to perform. There's no room to communicate with myself alone. I'm always creating with other people in mind, and in the long term that's exhausting. Speaking of godmothers, I think I was smitten with mine as a kid. Aunty P. She was awesome. Now as an adult, thinking about Aunty P., I can see how many of the attributes I aspire to are actually hers: her sense of social justice, her kindness towards others (that and me knowing to say nada when the Five-O come knocking). As kids especially, we internalise who we love. We take on what we think are the best attributes of those around us—that's how we grow. Children do it by imitating. They dress up in adult clothes and play, just the same as they pick up and try on different facets of other people's personalities, affectations and habits, dropping them just as easily when they find something better, when they're bored, or when they realise that what they've chosen to emulate doesn't suit them. From childhood on, we fill ourselves up with other people's personalities, myths and stories—fragments of who we'd like to become—which become ours through a process of imitation, assimilation, outright theft. "Immature poets imitate; mature poets steal; bad poets deface what they take, and good poets make it into something better, or at least something different. The good poet welds his theft into a whole of feeling which is unique, utterly different from that from which it was torn." Of course I didn't read this from Eliot directly. I found somewhere else—at the start of Austin Kleon's Steal Like an Artist,and he probably didn't get it from Eliot either. That's how culture works. What we value becomes contagious, getting transmitted over and over from person to person, artist to artist, parent to child, mutating with each iteration. This week, I've also been reading Hunter S. Thompson's Fear and Loathing in Las Vegas. In an essay in the back of the book it said that Thompson used to copy out sections of The Great Gatsby so he could absorb the cadences and feel of Fitzgerald's text. And so a novel about the 'roaring 20s' became the foundation for Gonzo journalism and Fear and Loathing's insights into a shambolic 70s. And in turn, people like chef-turned-writer Anthony Bourdain read Thompson and said, 'Hey, me too!' and continued the tradition with books like Kitchen Confidential. After a really interesting week exploring Louise Bourgeois' life and work, the question I've becomepreoccupied with is: 'Who do I love?' I mean reallylove. I was surprised how letting Bourgeois be 'my fairy godmother' produced some surprising effects, especially the idea that I should make time to be creative just for myself. The idea that I could write or draw purely for my eyes only—for relaxation or self-soothing—is new to me. 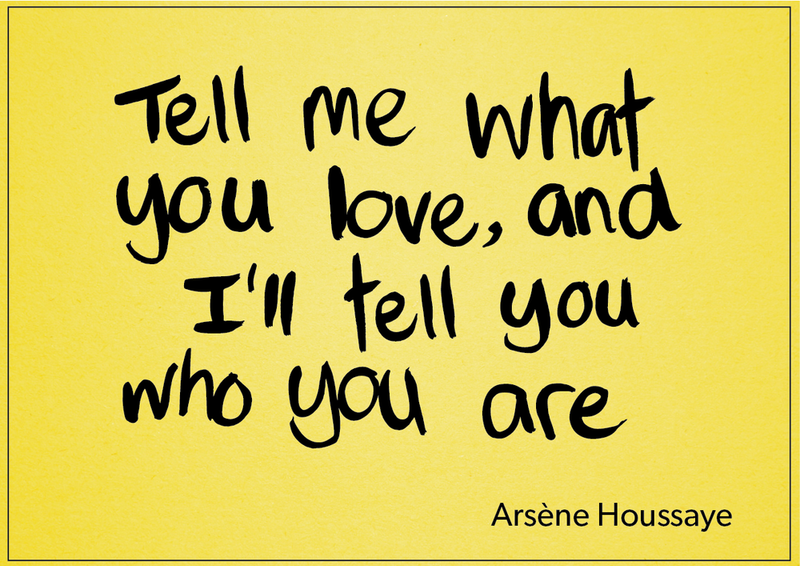 'Tell me what you love and I'll tell you who you are'; it's easy to lose sight of 'what you love' and 'who you are' as a consequence. 'Who you love' may be unrelated to what you're doing right now. The real you might not be the one you put on as you walk out the door. If you're like me, 'who you love' may be 'who you are' when you think no one's looking. Read more about Louise Bourgeois's art in part two of this issue and Rabbit Hole's very first interview! : “Louise Bourgeois: Intimate connections”.